Anne Marbury is one of the most important figures in American colonial history, and was a brave champion of religious freedom. She was born in 1591 to Francis Marbury, an early Puritan reformer, and Bridget Dryden, a descendent of King Edward I Plantagenet. Her father was very early identified as a non-conformist and in trouble with the establishment ecclesiastical authorties at the age of 23. He was an intellectual, and Anne was exposed to his mind and his library from childhood, so it is hardly a surprise that she grew up to think for herself. She married William Hutchinson 9 August 1612, and the couple became interested in the teachings of the Puritan preacher John Cotton, who had been ejected from his post because of his reformist views. In 1634, they followed him to Boston, aboard the ship "Griffin." Anne Hutchinson was a very charismatic person, and soon was holding study groups and having her own inspiration as to what religious truth was. She believed that one's salvation was determined by God's grace, not by obedience to ecclesiastical or civil authorities, and one could get inspiration for their own guidance directly from the Spirit. This greatly displeased the authorites and ministers at Boston, especially Governor Winthrop. The Puritans had fled England to escape persecution and worship differently than the Anglican church, but they were not willing to accord religious freedom to others, especially women, who had ideas that did not agree with their own. They branded her "antinomian" or lawless. Anne continued to attract followers, and was supported by her husband. Anne was tried for heresy in Newton and excommunicated and banished from the colony. Her family next settled in Rhode Island, where Roger Williams, himself under banishment from Massachusetts, had founded a colony which allowed religious freedom. However, she was still hounded by her Boston enemies, and so after Edward died in 1642, she felt constrained to move to New York, then under the control of the Dutch. She settled at Pelham Bay, now in the Bronx. At the time, the Dutch were at war with the Indians, and in August 1643, Anne and the children still living with her (some Hutchinson children were now adults living elsewhere) were attacked and killed by Indians, save Susanna Hutchinson, (our ancestor), aged 9, who was carried off and lived with the Indians for 4 years. 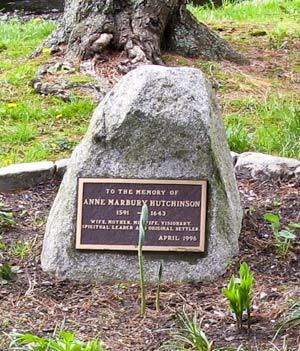 www.annehutchinson.com has her biography, trial transcript, and other items of interest. Divine Rebel: The Life of Anne Marbury Hutchinson , by Selma Williams is a biography of Anne which I recommend to all her descendents. American Jezebel: The Uncommon Life of Anne Hutchinson, the Woman Who Defied the Puritans by Eve LaPlante, another recommended biography. PBS "Trial of Anne Hutchinson"
Antinomianism in the Colony of Massachusetts Bay, 1636-1638, Chas. Adams, ed, , published 1894, on Google Books. 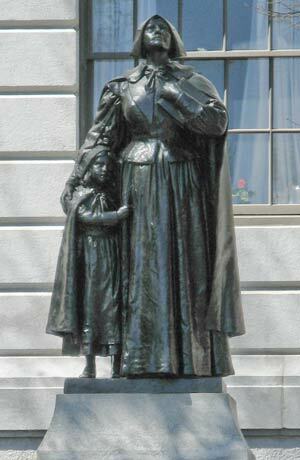 Anne Hutchinson, by Monica Barber. 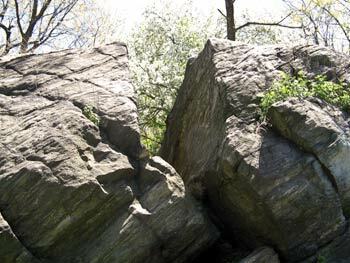 Split Rock in Pelham Bay Park in the Bronx, NY. This stone is near Anne's farm and may be the very place where Anne and her family were killed by Indians.